Mobile start-up Split has announced it has raised a $1 million seed investment from multiple private investors for its antisocial app on iOS and Android devices. Instead of connecting users to friends, the Split app allows users to specifically avoid certain people and interactions. The Split app gathers a user’s contact and social information, including content from Facebook, Twitter, Instagram and Foursquare. 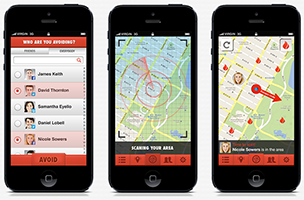 Users then mark others as “avoidees,” with the app alerting the user when they’re in the same area as those people they wish to avoid. When someone is “spotted” by the app, Split offers an escape route to avoid an unwanted or awkward encounter with the person. The Split app scans not only nearly locations, but also distant locations and a user’s favorite hangouts. The app marks some locations as “danger zones,” if an avoidee is frequently found there, and will also alert users when an avoidee is planning to attend the same event in the future. To balance things out, the app allows Split users to turn off their detection settings for up to 90 minutes. The company plans to launch new features over the next year to provide more antisocial tools for users. “During the process of designing the Split app, it was really interesting to see how people reacted to the idea of an app that’s primarily targeted at avoiding other people,” added Dagan. Split is available to download for free on iOS and Google Play. Check back soon to follow the app on AppData, our tracking platform for mobile and social apps and developers.